This article refers to the food. Sukiyaki is also another name for the song Ue o muite arukō by Kyu Sakamoto. Sukiyaki (Japanese: 鋤焼 or more commonly すき焼き; スキヤキ) is a Japanese dish in the nabemono ("one-pot") style. It consists of thinly-sliced beef, tofu, ito konnyaku (a jelly-like noodle), negi (green onions), Chinese cabbage, and enokitake mushrooms, among other ingredients. The literal meaning of sukiyaki is "grilling (焼, yaki) on a plowshare (鋤, suki),” referring to the time when meat was grilled outdoors in deference to Buddhist customs. Generally sukiyaki is a dish for the colder days of the year and it is commonly found on the menu of bōnenkai, a Japanese year-end party. The ingredients are slowly simmered in a shallow iron pot in a mixture of soy sauce, sugar, and mirin (sweet rice wine). Before being eaten, the ingredients are dipped in a small bowl of raw, beaten egg. A common joke in Japanese comedy is that making passable sukiyaki can be done with a very tight budget, especially if one is poor. Cattle were introduced to Japan via the Korean peninsula in the second century C.E., for use the cultivation of rice paddies. Cattle were seen primarily as working animals, particularly after the eighth century when Buddhism was introduced to Japan, and the killing of quadrupeds for food was prohibited by Buddhist law. In wartime, however, soldiers were given beef to build up their strength for battle. Returning with an appetite for beef, the soldiers cooked it on plowshares over hot coals outside the house, as the older generation considered cooking it indoors a sacrilege and desecration to the household. The literal meaning of sukiyaki is "grilling (焼, yaki) on a plowshare (鋤, suki)." Several cookbooks from the Edo period describe a sukiyaki which consisted of fish or fowl grilled on an iron ploughshare over a charcoal fire. Prolonged contact with the West during the Meiji era popularized the consumption of beef, and sukiyaki developed in its current form. Sukiyaki is a nabemono (one pot dish), often cooked at the dining table. Ingredients are simmered in a pot over a heat source set in or on the table, formerly a portable charcoal stove, now a gas or electric burner. The diners pluck their favorite morsels out of the boiling pot with chopsticks. The current style of eating out of a single large pot developed during the Meiji era; previously nabe cuisine was prepared in individual pots. Eaten directly from the boiling pot, nabe cuisine is very warming; sukiyaki is generally a dish for the colder days of the year and it is commonly found on the menu of bōnenkai, a Japanese year-end party. It is often prepared for special occasions and family celebrations. The raw ingredients are cut and arranged attractively on platters set on the table. Everyone sitting around the pot shares in the cooking, and there is opportunity for conversation while waiting for the ingredients to be ready to eat. Before being eaten, the ingredients are dipped in a small bowl of raw, beaten egg. Sukiyaki is served with bowls of steamed rice. A common joke in Japanese comedy is that making passable sukiyaki can be done with a very tight budget, especially if one is poor. The best sukiyaki, however, is made from top quality Japanese wagyu beef, especially the richly marbled beef from Kobe and Matsuzaka. The thinly-sliced beef is browned in the pan, then the broth is poured in and the other ingredients added in layers. Ingredients can include tofu, ito konnyaku (a type of noodles), negi (green onions), Chinese cabbage, enokitake mushrooms, vermicelli or rice noodles, spinach, carrots, and dark green leafy vegetables. The flavor of sukiyaki derives from the meat and vegetable juices and the flavor of the broth. The broth, or warashita, consists of soy sauce, sugar, sake and dashi (fish stock). Like other nabemono dishes, each Japanese region has a preferred way of cooking sukiyaki. For instance, soy sauce, sugar, and mirin are pre-mixed in the Kanto region, while in the Kansai region it is customary to mix the ingredients at the table. Sukiyaki, or simply "suki" is also the name for a type of meal enjoyed in various other parts of Asia. 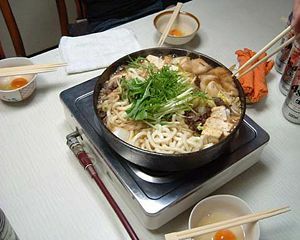 The name can be used for a dish remotely resembling Japanese sukiyaki eaten with rice noodles, pork, and "sukiyaki" sauce, to a meal where the diners cook various kinds of meat and vegetables themselves in a hot pot. Arrange vegetables and meat attractively on large platters and bring to table to cook. Use an electric skillet (360 degrees) or heavy skillet on a hot plate, or cook at the stove. Pour in one tbsp. oil. Add about a third of beef and stir-cook until slightly brown. Sprinkle two heaping spoonfuls (to taste) of sugar, ¼ cup shoyu, two tbsp. sake/wine and one cup of dashi. Bring to bubbling. Push meat to one side and add vegetables in layers, trying to keep each separated. Stir and cook only until tender, adjusting temperature. Have ready individual bowls with beaten raw egg, into which hot sukiyaki may be dipped to eat. Serve with steamed white rice. Keep adding vegetables, more sauce and meat to pan, cooking and eating as you go along. Hosking, Richard. A Dictionary of Japanese Food: Ingredients & Culture. Tuttle Publishing; New Ed edition, 1997. Tsuji, Shizuo; Fisher, M.F.K. (Introduction). Japanese Cooking: A Simple Art. Oxford University Press, USA; 1st ed edition, 1980. This page was last modified on 26 October 2015, at 14:34.